Monday morning at the office when you are an Adventurer is actually pretty nice. Yes, sometimes I have to knuckle down to the Mac and do some “proper” work, but I also have the option to get outside and do something fantastic, and so it was this week. 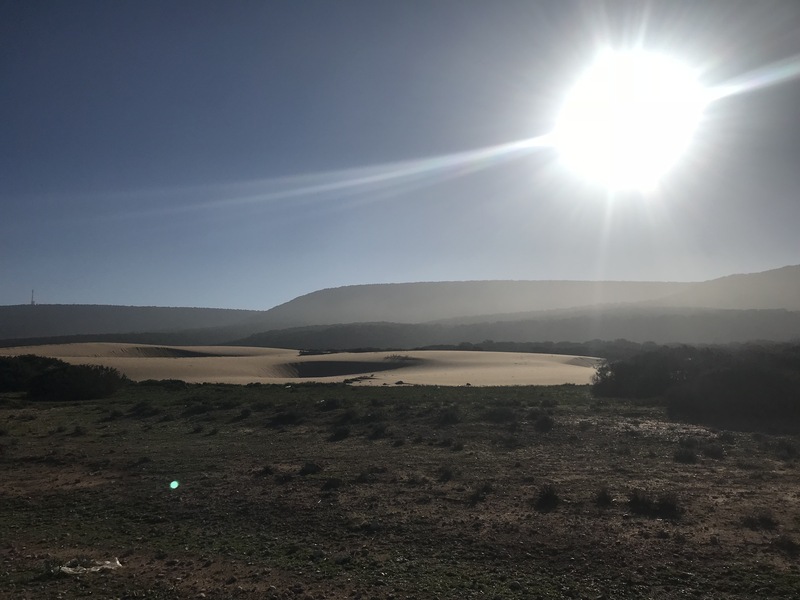 My new running partner in Morocco, Rachel Bonkink, and I had decided, while out trotting along our local beach route one day, that it would be fun to plan a mini adventure, and run from the village of Moulay Bouzektoun up the coast, following the beach, back to Essaouira, where we live. Rachel had never run more than 5km before, but she is a yogi and does fitness for a living – Revealing Vajra Yoga Retreats – so I put together a little 3-week training plan (3 x 5- 9km runs every week back to back and two longer runs of 10km and 13km) and we set the date for the 12th of February. 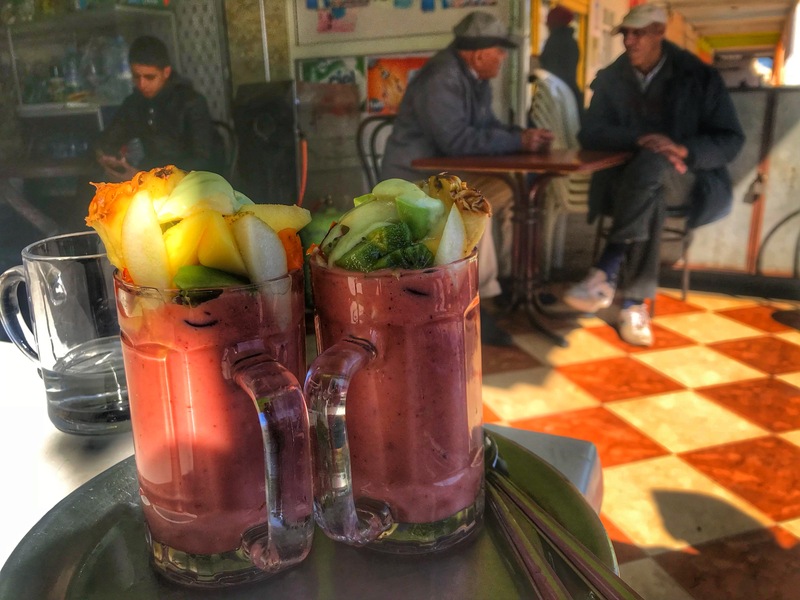 We were a bit stymied by a week of rain and freezing cold in the lead up, but the 12th dawned, and we met at Bab Sbaa in Essaouira, as planned, at 8 am. We’d arranged for Mohammed to drive us up to Moulay Bouzektoun, and to run back, for three reasons: firstly, the prevailing winds, which can be extremely strong, are from north to south, and so we would have the wind at our backs; secondly, psychologically, the thought of “Running Home” is a powerful incentive, and, thirdly, there is very little in Moulay Bouzektoun in terms of post-run celebration spots. The beach lay ahead of us in all its virgin glory. It was a perfect day with a glorious blue sky and great visibility and – surprisingly – a very mild wind. We set off over the first section of green seaweed and coral rocks where the Bouzektounians gather mussels. Soon, we were hammering along on the sand…. Those happy, smiling faces lasted about another 3km until we hit the quagmire. Deep, thick, wet, claggy sand, dragging down the legs and the spirits. We zig zagged up and down the beach looking for a harder surface “Better up there?”, “Nope.”, “Harder up there?” “No, just the same.” I got a weird pins and needles feeling in my feet but consoled myself with the thought, “Nothing lasts forever.” True, but it lasted for the next 10km on and off which seemed like forever! Rachel and I talked our way along the sands, enjoying the tiny seabirds pecking away diligently at the water’s edge and the large flocks of gulls holding what looked like a very important board meeting further up the sands. At one stage, the trail branched off the beach and into the scrubland, winding through sandy earth, greened by the recent rain. To our left, dunes gleamed under the sun. It’s a mixed blessing when your destination finally appears in the distance and it is a long way to go. We were still in sand clag and it seemed a lot further off than the total 16km I had banked on, but as we drew closer, I realised that the back part of the city, was jutting out further than our end point, which was at the other side. Rachel was right, we were nearly there, she wasn’t just being ultra-yogi-positive. Leaving the sand was a relief and we trotted up the last few hundred metres to end, as all good trail runs do, in a car park outside the supermarket. Ah! the pleasure of self-congratulation that ensued. We high fived, hugged and declared our awesomeness to each other. 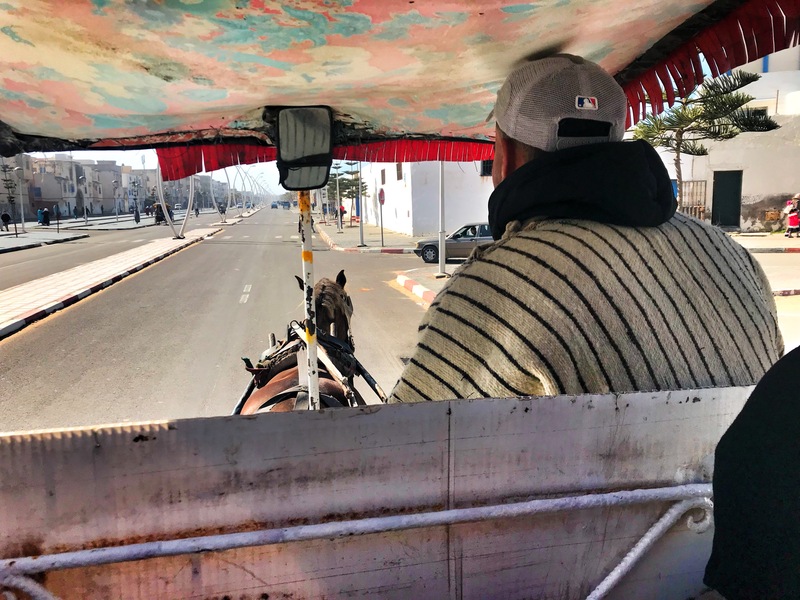 Then, this being Morocco, we climbed into a horse and buggy, regaling the driver and the family opposite with tales of our prowess. Our destination? Rachel’s favourite local juice bar for a reviving rehydration drink. Strawberries, pineapple, papaya and oranges all smooshed together. What a way to finish off a Monday morning and a mini adventure in Essaouira.